'This is because most parties are genuinely concerned about what Hindutva politics does to Indian society,' argues Aakar Patel. 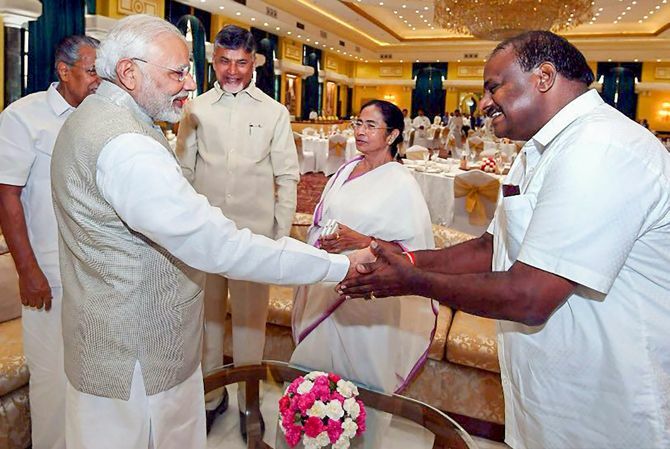 IMAGE: Prime Minister Narendra Damodardas Modi greets Karnataka Chief Minister H D Kumaraswamy as West Bengal CM Mamata Banerjee, Kerala CM Pinarayi Vijayan and Andhra Pradesh CM Nara Chandrababu Naidu look on at the NITI Aayog governing council meeting in New Delhi, June 17, 2018. Photograph: PTI Photo. Both the prime minister and the BJP president feel that the Opposition's 'sole agenda is to remove Modi'. They have said it clearly in interviews and speeches recently. The accusation could be true or false. Let us first assume it is true. The question is why the Opposition wants to remove Modi. There could be two broad reasons. One is negative (meaning that the Opposition want to get together to ruin the country but they are being blocked by the lone, heroic Modi). The other is for positive reasons. Meaning that the Opposition want to get rid of Modi because they think they can put together an alternative government that is better than Modi's. This sentiment could also be coloured by the fact that some of the Opposition think that Modi is ruining the country. Looking at it dispassionately, it appears that the first motive seems to be too simplistic to be taken seriously. India is a democracy of long standing. It has a sophisticated political system and political parties have negotiated it since Independence. Many parties have clearly expressed ideologies, charismatic leaders and have had faithful followers over decades. To dismiss all of them as having a 'sole agenda' is to be blind to history. Also the very idea of a sole agenda and a united Opposition is not visible. The reality is that there is no broad national alliance yet. Many states like Tamil Nadu, Andhra Pradesh, Odisha, West Bengal, Telangana and Kerala have not seen such an alliance and are unlikely to see one before the election. In many of these states the Congress is a bigger threat to the regional party than the BJP or Modi. In Madhya Pradesh, Gujarat, Haryana, Punjab, Rajasthan and Chhattisgarh, there is no such alliance either because these are more or less two-party states in which the Congress has a straight fight with the BJP or the NDA. Now let us look at the other possibility: Ihat the accusation is false. That the Opposition does not have a sole agenda to remove Modi. But it is undeniable that the Opposition is doing unnatural things to oppose Modi. The Samajwadi Party and Bahujan Samaj Party are not natural allies. They have fought against each other for most of their political histories. So why are they getting together now? The answer is that the Opposition parties have been doing this since long before Modi. The primary division of India's politics till 1989 was Congress versus non-Congress. The party of Indira and Rajiv was arrogant and often dangerous because it was totally dominant for decades. After the BJP took up the Ayodhya issue and tore down the Babri mosque, the division changed. The Opposition, including the Communists and the regional parties, began to distance themselves from the BJP because they thought it was dangerous for India's social fabric. You could argue that they were wrong in assuming this, but it would be false to say that they have only started allying against the BJP because of Modi. L K Advani described the untouchability of the BJP as '“splendid isolation', but that was just clever wordplay. Hindutva worries most Indians and makes parties uncomfortable. That is the only explanation. The success of the BJP after Babri has meant that it has always found some parties willing to join it when it has come close to power, as during the Vajpayee years, and Nitish Kumar's Janata Dal faction now. But except for two allies -- the Akali Dal and Shiv Sena -- it has not found any permanent friends. This is because most parties are genuinely concerned about what Hindutva politics does to Indian society. Modi and Shah, if they actually believe what they say about the sole agenda, should reflect on one thing. You could be opposed to the majoritarian politics of Hindutva and be a voter of any kind of party. You could support Communists, Socialists, caste-based parties, regional parties, independents, language parties and every possible sort of political formation across India. But if you back Hindutva there is only one party for you and that is the BJP. To assume that what the 31% BJP voters are doing is pious and nationalistic and what the other 69% are doing is opportunistic is not a mature way of looking at Indian politics. Of course, it is true that all political parties want power and will do unusual things to secure power. This includes Modi and the BJP. They are not in government for different reasons. All parties think that they can make a positive difference and all leaders want to go down in history as having made a significant contribution. That is the reason parties are formed and why they operate, not because they are obsessed by a sole agenda against an individual.